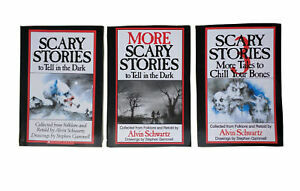 Kids adore a bedtime story, and it's even better when it's "Set Scary Stories to Tell in The Dark". The book by Alvin Schwartz comes in volumes one, two, and three. Brought to you by Scholastic, this three volume set of paperbacks includes artwork for your kids to enjoy. The theme is ghosts and spooky stories, and the suggested age range is 9-12 years old. Scare them with his great book and inculcate a lifelong love of reading.